Summary of outcomes: The thirteenth meeting of the Conference of the Parties to the Basel Convention (BC COP-13), the eighth meeting of the Conference of the Parties to the Rotterdam Convention (RC COP-8) and the eighth meeting of the Conference of the Parties to the Stockholm Convention (SC COP-8) were held back to back from 24 April to 5 May 2017. The meetings also featured a high-level segment that was held on the afternoon of Thursday, 4 May and the morning of Friday, 5 May 2017. The theme of the meetings and the high-level segment was "A future detoxified: sound management of chemicals and waste". The meetings included joint sessions among two or three of the conferences of the parties on joint issues. 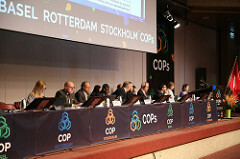 The meetings, attended by about 1,400 participants, as well as as well as 80 Ministers, from 170 countries, adopted more than 60 separate decisions, including six identical ones for the three meetings on: International cooperation and coordination, enhancing cooperation and coordination among the three conventions, clearing-house mechanism for information exchange, mainstreaming gender, synergies in preventing and combating illegal traffic and trade in hazardous chemicals and wastes, and “from science to action”. The list of meeting participants, as at 19 May 2017, is available from here. Media background notes on the COPs with all you need to know about the 2017 Triple COPs in one place. 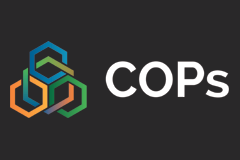 Briefings on the 2017 conferences of the Parties to the Basel, Rotterdam and Stockholm conventions can be accessed on the briefings page.